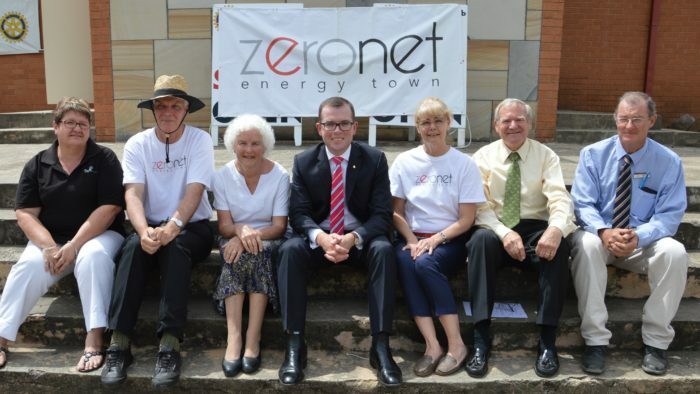 MEMBER for Northern Tablelands Adam Marshall today announced $50,000 in State Government funding to help take Uralla’s Australian-first Zero Net Energy Town (ZNET) project to the implementation stage. Mr Marshall said the local ZNET reference group would use the funds to employ a project co-ordinator’s work with the community on energy efficiency and renewable energy initiatives outlined in the ZNET Blueprint, which was launched by Environment Minister Mark Speakman in November last year. “The co-ordinator will also identify ongoing funding sources, grants and initiatives for longer term funding as part of the Uralla’s plan to become Australia’s first renewable energy self-sufficient town,” Mr Marshall said. Mr Marshall said appointing a co-ordinator was the next step in the project following last year’s Zero Net Energy Town (Z-NET) blueprint launch. Mr Marshall said the aim of the ZNET blueprint was to identify how an Australian community could generate all its energy needs from renewable energy, in a way that is competitive in terms of price, quality, security and reliability. He said the blueprint detailed how Uralla and a similar sized town could generate its energy needs from renewable energy. “Uralla is well on its way to be a blueprint for other towns across rural and regional NSW, and Australia, that want to become energy efficient,” Mr Marshall said. Today’s announcement brings total state government funding support to $150,000 with more in the offing if Mr Marshall has anything to do with it. “This is such an exciting yet simple initiative that I’d love to see replicated across other regions and towns,” he said. “With ZNET getting legs and combined with a number of impressive solar and wind projects completed or about to begin construction, we’re creating a wonderful renewables cluster in the Northern Tablelands, which is something I’m very keen to foster and give my full support. Environment Minister Mark Speakman said Uralla could achieve 40-70 per cent of its energy goal within 10 years by using available programs and commercial products. “One of the first actions of the Uralla Z-NET project will be to deliver Renewable Energy and Energy Efficiency projects in households and businesses,” Mr Speakman said.